Heart failure (HF) is an important public health problem. It is associated with disability, mortality and increased healthcare expenditures, especially among those over 65 years of age. 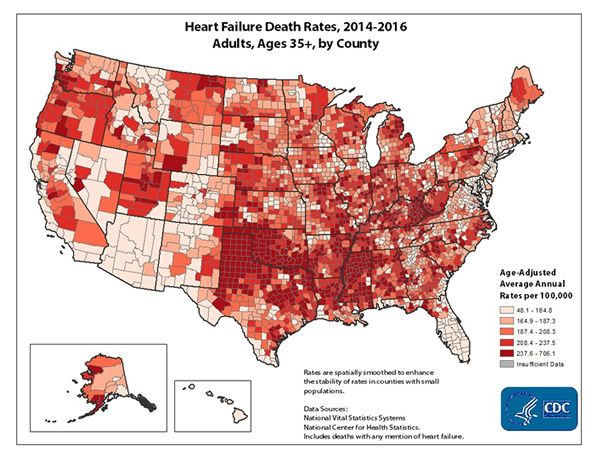 The American Heart Association (AHA) estimates that 1 in 33 (8 million) Americans will be living with heart failure by the year 2030. The cost of treating HF is expected to more than double from 2012 to 2030 due to an aging demographic as well as growing care and technology expense (DHDSP, 2016). HF mortality rate varies by geography (DHDSP, 2016). Age over 65 and comorbidities can compromise the myocardium. Heart failure is a leading cause of hospital stays among people on Medicare. Race - Blacks are more likely to have heart failure than people of other races. They’re also more likely to have symptoms at a younger age, have more hospital visits due to heart failure, and die from heart failure. BMI above 25 kg/m2 increases the risk of HF, diabetes type II and cardiovascular disease. Cardiomyopathies are muscular abnormalities that cause inadequate cardiac output especially during exertion. Substance abuse: alcohol, cocaine etc. Drazner, M. (2011) The Progression of Hypertensive Heart Disease. Circulation,123(3). Go A.S., Mozafarian D, Roger V.L., et al (2013). Heart disease and stroke statistics—2013 update: a report from the American Heart Association. Circulation. 127(23).